Whether you are just beginning to set up a garden with native plants or are already a master recycler, all are welcome at this free event, presented by Keep Euclid Beautiful. The event features presentations, workshops, interactive table displays for kids and adults. A featured workshop is Rain Barrel building with the Cuyahoga Soil and Water Conservation District. Meet the new Euclid Creek Watershed Program Manager, Elizabeth Hiser, who will teach participants how to harvest stormwater. 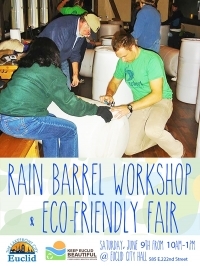 While the workshop is free to attend and listen (just like all the other programs at the Eco-Friendly Fair), if you want a rain barrel, you must pre-register at http://www.cuyahogaswcd.org/events/2018/06/09/rain-barrel-workshop--euclid. Rain barrels cost $60. BUT, the first 10 registrants who live in the City of Euclid in the NEORSD service area GET A FREE RAIN BARREL! 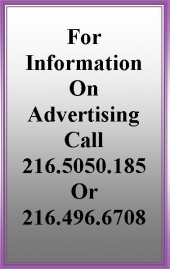 Please register by phone if you think you qualify at 216-524-6580x1002. Learn best practices from local organizations including the Cuyahoga County Department of Sustainability, City of Cleveland Water, Urban Renaissance Farms, Friends of Euclid Creek, Cuyahoga Soil and Water Conservation District, Cuyahoga County Solid Waste District, Gardenscapes by Joanna, LLC, Alliance for the Great Lakes Adopt-A-Beach, Drink Local Drink Tap, Bike Euclid, Bluestone Heights, Rust Belt Riders, and Cleveland Metroparks. For a schedule of workshops and presentations, please check out https://www.facebook.com/events/1640357109383317/. Information tables will be set up in the lobby of City Hall throughout the event, so drop by anytime between 10am and 1pm.